With breathtaking performances by the Borromeo String Quartet, Kani Karaca, and flautist Helen Bledsoe, Invocation plunges listeners into the sonic world of Istanbul-based American composer Michael Ellison. Acclaimed by American Record Guide as 'beautifully crafted...robust and absorbing,' Ellison's music is a subtle and tantalizing amalgamation of diverse influences into a dramatic and effervescent personal style incorporating Turkish and Black Sea motifs. Ellison's String Quartet #2, composed for the masterful Borromeo String Quartet (supported by the NEA), is a case in point: a large-scale 'whitewater-rafting' (Cape Cod Times) spiritual journey of seven movements evolving from fragments into a fiery all-encompassing conclusion. Invocation-Meditation-Allegro, likewise pushes the flute into new territory; Helen Bledsoe uses Just Intonation and extended effects that evoke the Ney and Shakuhachi to convey Ellison’s transcontinental vision. Of special (and even historical) interest is the inclusion of the last testament of one of the great masters of Turkish Music in the Twentieth-Century, the blind hafız Kani Karaca (who could recite the entire Qu’ran from memory). This proved be his penultimate performance and final recording made in his storied career--he passed away four months later. In Elif, an experimental work recorded live at Istanbul's International Spectral Music Conference in 2003, the timeless, timbrally varied voice of Karaca is placed in the center of an atmospheric ensemble-halo — almost as a holy book lost in the desert — over which the sands of time wash and recede. Metaphorically, the piece in its mysterious way reflects the extremely tenuous position of Karaca's tradition in this contemporary world. This remarkable recording thus marks both Karaca's daring to do what few Turkish traditional musicians have attempted, and Ellison's ongoing involvement with Turkish musicians and immersion and its makamic (modal, improvisational) tradition. Michael Ellison has received numerous awards for his compositions, including from Copland House (2006), the Beebe Foundation (New England Conservatory), the Ojai Festival, the Barlow Endowment, and ASCAP. The support of the Fulbright Foundation (1997-98) and ARIT (American Research Institute in Turkey) facilitated field research in the classical and folk music of Turkey (2000-1), research which continues to inform much of his current output. In 1995, Ellison’s Cry in the Wilderness, commissioned as winner of First Music 11 competition, was premiered by the New York Youth Symphony and Miguel Harth-Bedoya in Carnegie Hall. His chamber works have been performed by the Pittsburgh New Music Ensemble, the Berlin Saxophone Quartet, Frøydis Ree Wekre, the Calgary Philharmonic, and by flautist Helen Bledsoe at the Gaudeamus Festival in Amsterdam. Since 2002 he has served on the faculty of MIAM Center for Advanced Studies in Music at Istanbul Technical University. 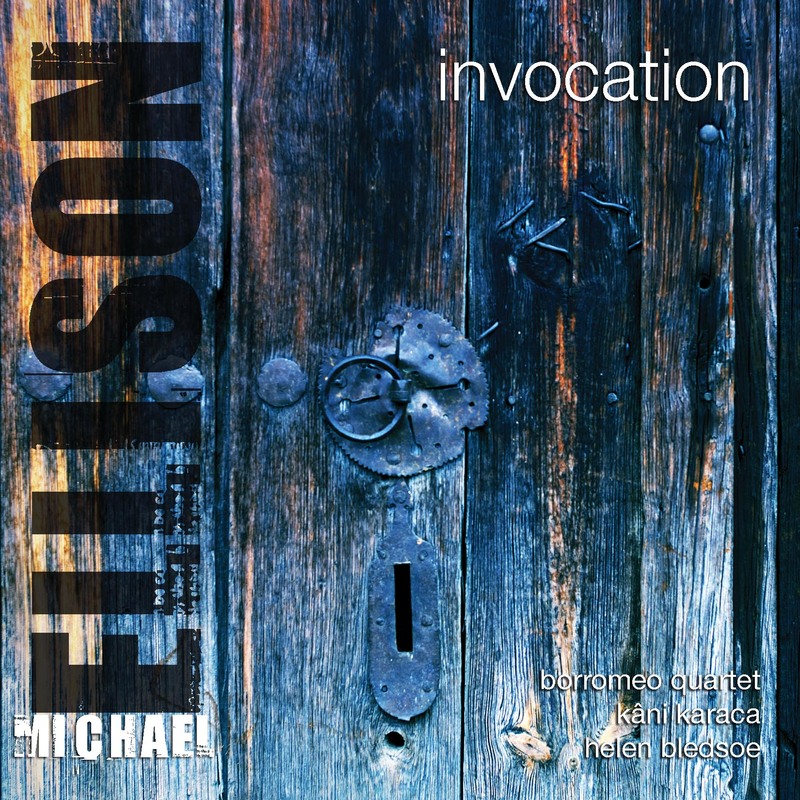 Although Michael Ellison is well known among folks in the more artsy music circles, most listeners are probably not familiar with his music...despite the fact that he has won numerous awards for his compositions over the years. Invocation is a mighty big dose of smart modern classical music. The album is divided into three parts. "String Quartet #2" features the incredible talents of the Borromea String Quartet (the piece is divided into seven separate segments). Beautiful, subtle, and mesmerizing stuff. "Invocation-Meditation-Allegro" features the very focused and intense flautist Helen Bledsoe. The album ends with "Elif," a really peculiar composition featuring the strange vocals of Kani Karaca. This is obviously totally eclectic stuff...so if you're looking for classical music that is predictable and easy to swallow you won't find it here. Hypnotic and slightly drifting... Top pick. ... [Ellison's] "String Quartet #2" has the melodic, harmonic, rhythmic and emotional depth of late Beethoven or Bartok. The seven-movement piece evolves gracefully, using thematic material that reappears transformed, but with haunting familiarity. Full of dynamic subtleties, finely shaded changes in timbre and passionately engaged ensemble playing, the piece resonates with the eloquent emotion the composer wove into the fabric of this gorgeous composition. "Elif" is an amazing synthesis of a master hafiz (a reciter of the Quran) and new music. The result is otherworldly, a mystical atmosphere of devotion and its transformation of consciousness. Invocation illustrates the depth of Ellision's commitment to absorbing Turkish spiritual music and the Sufi quest for transcendence and union with the beloved. Recommended.